This newsletters is written to make business owners aware of the needs for advice for the future transition of a business. According to the U.S. Census Bureau statistics, there are nearly 30 million businesses in the United States today, meaning that a majority of these businesses will require a process other than an Initial Public Offering (IPO) of stock in order to achieve liquidity or turn the company stock (or assets) into cash. Our objective in this newsletter is to bring a few of these facts to light and provide some guidance as to who may be a buyer of your business in the future. The majority of businesses in the United States today are ‘small’ businesses – enterprise values of less than a few million dollars. 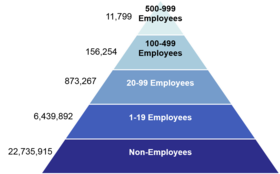 The following chart illustrates the wide base of small businesses relative to the very small number of large, publicly traded businesses (organized by the number of employees within each organization) that sit at the top of the pyramid. Since a large number of business owners are Baby Boomers, this means that as the Baby Boomers begin to exit these businesses through retirement, the supply will likely outweigh the demand for business ownership. To put this challenge into even greater perspective, it needs to be stated that smaller business owners are generally going to have a harder time with their exit than larger businesses. Small businesses are often times more dependent upon the individual efforts of the owners of the business. As a result, many owners of smaller businesses are actually not selling an enterprise, rather they are selling a job. It is helpful for owners to understand the difference and to be aware of what, if anything they are able to sell to someone else. As we enter 2015, we are seeing an improved economy and a willingness of buyers and investors to ‘come back into the market’ to acquire businesses. These factors have a large impact on your business exit. Remember that it was not so long ago when we faced a global financial crisis and the depressed economy created a reduced demand for the purchase of any businesses. Given that markets run in cycles, it is not a question as to whether or not there will be another recession, but rather, when it will occur. And, since recessions tend to last for a few years (on average), you need to consider your age and how much longer you want to continue to own your business if you have not started executing an exit transaction in the next few years. With the first Baby Boomers turning 69 years old in 2015, the next economic slow-down may result in many of these exiting owners holding onto their enterprises for another few years. When the economy does eventually recover, these leading Boomers will be in their mid-seventies. At that point in time, we can forecast that many will be anxious to exit their businesses as retirement draws closer and closer. These forecasts, if correct, will result in a glut of businesses in need of buyers or successors. Without many buyers or successors available, the challenges increase. You should begin to consider your exit strategy planning today in order to protect the wealth that is trapped in your illiquid business. Plan your exit and work that plan. This way, you will be prepared no matter what the financial and economic markets bring. A well thought out exit strategy plan is your best approach towards reaching your exit goal.